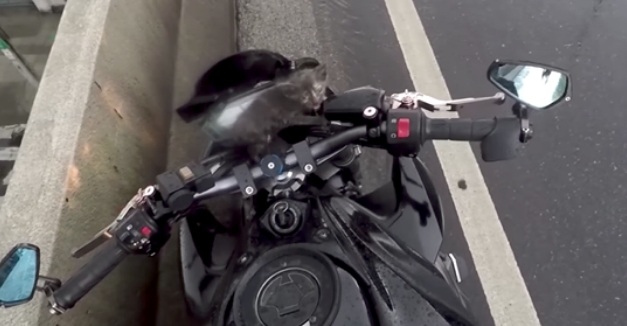 A motorcyclist driving on a freeway in Bangkok, Thailand, noticed the teeniest baby kitten in the middle of the road recently, so naturally, he stopped. The man managed to stop one lane of the busy highway, and was forced to ask a car to reverse a few inches so that he could retrieve the poor little cat. The cat was terrified, but looked relatively uninjured from the incident. The little kitten was responsive right away. Miraculously, he was OK. The kind-hearted man quickly grabbed the kitten and took him with him. Bangkok's not an easy city for humans, but it's a whole lot tougher for 4-legged beasts. The heat, the pollution, the noise, the lack of greenery and natural spaces and the general craziness of the place make it a challenge for domestic animals, many of which are homeless. All over Bangkok there are armies of stray cats and dogs and many live on the street, eking out an existence in much the same way that homeless people do, scavenging for scraps and benefiting from people's goodwill. Anybody who has spent significant time roaming about the streets and back-alleys likely would have noticed a few furry little feline friends wandering around Bangkok which is simply littered with cats. Responses to "Motorcyclist Rescues Tiny Kitten Stuck On Busy Road"
Wow so close. I would have stuffed the little fella in my jacket. Hopefully it made it to a safe place.